Charlie Brooker: before and after. We're all familiar with what happens when a writer's personal problems start to intrude upon their work — characters are killed off left and right, plots are resolved either in a depressing fashion or not at all and the worldview espoused by the work as a whole seems much bleaker than it was before. But what happens when the opposite happens? Whether by dint of marriage, the birth of a child, the author finding religion or some other cause, the author now finds themselves in a much happier place than they were before. And, hardly unexpectedly, this starts to bleed into their work, which becomes Lighter and Softer and much more optimistic. Just as Creator Breakdown isn't necessarily a bad thing from an artistic standpoint (many artists produce their best work while feeling down in the dumps), this trope isn't necessarily a good thing either: feeling happy and self-satisfied can often lead to an artist becoming complacent and unwilling to push themselves creatively. On the other hand, a sunnier disposition may result in an author cutting down on the Wangst and producing something more accessible. This is the Opposite Trope to Creator Breakdown and, just as with that trope, Word of God examples are required for it to qualify. See also Tone Shift, Lighter and Softer, Darker and Edgier and True Art Is Angsty. Zig-Zagged as of the much darker third installment, which pulled a Happy Ending Override on 2.0's hopeful cliffhanger. Anno put the final movie on hold to work on other projects in light of the relapse of his depression that occurred while working on the third film. He recovered again thanks to Shin Godzilla, and has hinted that the final Rebuild film is in the works. In-universe example: Ryu Shizuka from Bakuman。 writes dystopian fiction, but after his editor takes him to a cabaret where he talks to women for the first time, his main character slowly develops into a Mary Sue who spends most of his time with a harem of hot women. After the editor shows him the women were only nice to him because they got paid, Shizuka becomes disillusioned again and continues writing about how all Humans Are Bastards (even women). Gen Urobuchi. In Fate/Zero's afterward he wrote that he wanted to write a heartwarming story one day, but couldn't because of his "tragedy syndrome". Then came Puella Magi Madoka Magica where he does manage to write something heartwarming exactly as he described in the Fate Zero's afterward. Since then, his later works have fallen more on the idealistic end, such as (the admittedly still dark) Psycho-Pass and Gargantia on the Verdurous Planet. It probably helps that Madoka Magica has put him on the map as a writer of television shows. Even when he wrote one of the darkest Kamen Rider shows of The New '10s and Madoka Rebellion took a fire ax to the bittersweet ending of the series, they managed to be idealistic to a degree. Yoshiyuki Tomino. Try comparing the bleakness of Mobile Suit Victory Gundam, which was made at a particularly low point in his depression, and ∀ Gundam, done after he overcame it. Another in-universe example in Shiro Bako. Seiichi Kinoshita received a big award for his early directing work, then wound up having his reputation ruined with Boing Boing Paradise. After years of minor work he finally earned some respect from his original series Exodus. In comparison, one of the driving conflicts in the first season, when Exodus was being worked on, was Kinoshita's problems in finishing the storyboards, which put pressure on every other aspect of production. In the second season, after Exodus was widely praised, Kinoshita is in such a groove that he finishes the storyboards for Third Aerial Girls' Squad weeks ahead of schedule. Tom Baker's performance as the Doctor in the Big Finish Doctor Who Fourth Doctor Adventures, which he started doing in the 2010s, is notably a lot softer and more considerate than his often selfish and stormy portrayal in the 1970s. Forty years in which to mature, decades in a happy and stable marriage, and getting his drinking under control had mellowed him out a lot, and since his Doctor was always heavily based on himself, so the Doctor mellowed out too. He also made up with Leela's actress Louise Jameson (whom he used to bully in the 70s), and his audio performance is warmer towards her, letting her have Character Focus and not stepping on her lines like he used to do on television. Fan reactions were mixed, with a lot of people missing the unhinged, dangerous craziness of his 70s portrayal or feeling the new performance is Out Of Character, but many others appreciating the new, gentle take on the character as a side to the Fourth Doctor we didn't get to see back in the day yet still is unmistakably him. Alan Moore has admitted that he was going through a period of depression and disillusionment when he wrote Watchmen, but he eventually got over it. Almost all of his major works after Watchmen (with the exception of From Hell) have been more optimistic and light-hearted than that one. Cathy Lee Guisewite, creator of comic strip Cathy, often jokes that her boss at the syndicate dreaded the day she entered a stable relationship and became a more secure, confident person. When just that happened, Guisewite chose to end Cathy rather than let it fall victim to this trope. Sophie Campbell, creator of Wet Moon and Shadoweyes, fell into a funk around 2011, after the strain of being a closeted trans woman became more than she could bear. Since coming out as trans, she's made a recovery and is now being hailed for her work on the Jem and the Holograms series. Paul Dini wrote Dark Night: A True Batman Story as a way of coming to grips with the brutal 1993 mugging that nearly killed him. When Harry Met Sally...: Rob Reiner got the idea for the film after a divorce and a string of complicated relationships before then. He met his next wife while developing the film, and their marriage inspired him to change the ending so Harry and Sally do get together after all. The tone of Walt Disney's 1960s output (Mary Poppins, The Jungle Book, The Absent-Minded Professor, etc.) was considerably lighter than anything he had done previously. It coincided with his studio turning a steady profit for the first time in its history thanks to the ancillary revenue from theme parks and TV shows, ending a long and stressful period of being almost perpetually in debt from the early 1920s through the late 1950s. Zack Snyder fell into depression and stepped down from the production of Justice League after his daughter died during post-production phase. Fortunately for Snyder, he would later make a comeback with directing Army Of The Dead 2020, an experience that he found rather cathartic. David Drake's fiction after Redliners is less harsh and more optimistic, with a little more faith in humanity. Author's comments . My faith in Christ is central to my life. My conversion from a pessimistic atheist lost in a world I didn't understand, to an optimistic believer in a universe created and sustained by a loving God is crucial to me. Sadly averted by Douglas Adams, who stated that he was going through a rough patch when writing the fifth The Hitchhiker's Guide to the Galaxy book and set out to write a sixth to correct the last one's Downer Ending. Unfortunately, he suffered an Author Existence Failure before it could be completed. A sixth Hitchhiker book was later written by Eoin Colfer, to mixed reviews. In-universe example: in Juliet, Naked by Nick Hornby, Tucker Crowe was once an angsty rock singer who released an acclaimed album inspired by a bad break-up, then dried up creatively and walked out of his career. At the end of the novel, having settled down and fallen in love again, he releases a new album of happy songs. The fans on his internet forum, who love his angry early output and the mystery surrounding his decades-long disappearance, are severely disappointed. The page image is Charlie Brooker, whose notoriously downtrodden, cynical and at times genuinely very dark and heartbroken material has, if not entirely taken a more upbeat turn, is now less constantly depressing after his marriage to Konnie Huq, a former Blue Peter presenter. He doesn't know how this happened, either. Billie Lourd was cast in American Horror Story: Cult around the time her mother Carrie Fisher and grandmother Debbie Reynolds both passed away. She says filming the show and playing Winter helped her recover from their deaths and heal. She even credits Ryan Murphy for saving her life by casting her. Barry McGuire is best known for his depressingly cynical anti-war song "Eve of Destruction". His best-known post-spiritual-conversion song is "Cosmic Cowboy", an optimistic song with Jesus in the title role. Pet Shop Boys' album Very was more upbeat and exuberant than their prior albums (especially its immediate predecessor, the gloomy, reflective Behaviour), owing to singer/lyricist Neil Tennant being in love at the time. It is sometimes referred to as their "coming-out" album, as Tennant had begun openly discussing his homosexuality for the first time during this period. Billy Joel's very upbeat and poppy An Innocent Man, a tribute to Joel's musical influences from The '60s, followed the cynical, sociopolitically charged The Nylon Curtain. While TNC was recorded during Billy's divorce from his first wife, AIM was a product of then-single Billy enjoying life as a bachelor and dating a number of supermodels, most notably his future second wife Christie Brinkley. Starflyer 59's album Gold was written and recorded while Jason Martin was on the verge of a nervous breakdown, due to the messy ends of several friendships and the stress of recording the album practically by himself. For the follow-up album, Americana, Jason Martin had a full band playing with him and producer Gene Eugene to help with the duties of recording, so it was a much more "fun" rock album. It's probably not a coincidence that Jason switched to playing New Wave music and almost entirely abandoned guitar distortion shortly afterward. With Teeth, the fifth major release by Nine Inch Nails (following the intensely bleak The Downward Spiral and The Fragile), could quite justifiably be considered this for Trent Reznor, who indeed admitted in an interview around the time of the album's release that he has been "pretty happy." Reinforcing this is the fact that Trent surprised many fans by returning from his hiatus quite ripped, and that he would end up getting married (to Mariqueen Maandig, with whom he now creates music in How To Destroy Angels) four years later. The quality of Ozzy Osbourne's albums are closely tied to his own happiness in the period they were made. Blizzard of Ozz and Diary of a Madman were the first time in years that he was having fun doing music, while No More Tears was made when Ozzy was finally able to move past the controversy and personal strife he experienced in the 1980s. Avril Lavigne composed her second album "Under My Skin" while going through a bad break-up and it was full of Darker and Edgier material. She expressed regret over that and her next album "The Best Damn Thing" was in her own words "trying to have fun in music again", and it featured a lot more upbeat songs. Eminem was going to create a direct sequel to Relapse, titling it Relapse 2. Along the way, he changed his tone and even showed things were better for him by naming the album Recovery. The first single off the album was the uplifting "Not Afraid". Marina & the Diamonds's first two albums, The Family Jewels and Electra Heart, are considerably negative, mostly focusing on her experience feeling hopeless and unloved and how she became The Casanova to circumvent this, but still feels empty. Froot, on the other hand, is decidedly more upbeat and positive, with the song "Happy" even lampshading this trope. Imagine Dragons proclaimed in the 2017 single "Believer" that frontman Dan Reynolds overcame the depression that made much of their music since late 2014 sound disillusioned and/or apologetic. Pearl Jam spent the George W. Bush administrations doing angry, politically charged and pessimistic music, with Riot Act and the Self-Titled Album for the latter. In 2009, with the end of Dubya's presidency and Barack Obama's election, the band released the much happier-sounding and hopeful Backspacer. Also in 2009, Green Day had 21st Century Breakdown, a critical Rock Opera much like predecessor American Idiot, but it at least ends on a hopeful note (partially inspired by the political change) compared to the other's Downer Ending. Metallica had a very public Creator Breakdown that spawned St. Anger, that as a result sounds abrasive in both sound (lacking solos and with trashcan-sounding drums) and lyrics (angsty and depressing). Once they were content with their lives again, the result was Death Magnetic, sounding closer to their earlier albums and with lyrics cryptic but not brooding. Keith Urban seemed to go through this twice. The first time came in 2001 when, after spending most of the year off the charts and going into rehab for cocaine addiction, he resurfaced with the cheerful "Somebody Like You", still his biggest airplay hit to date. The corresponding album, Golden Road, was also the first to truly establish his sound after the Early Installment Weirdness of his first American albums. After lapsing back towards his demons around 2006-07, he once again started putting out happier material around the release of Love, Pain & the whole crazy thing. His marriage to Nicole Kidman also seemed to influence him to put out more happy upbeat love songs. Ty Herndon went through this. After a Creator Breakdown in 2002 that led to him gaining weight, abusing drugs, and losing his recording contract with Epic Records, he spent most of the noughties cleaning himself up. This resulted in his 2007 album Right About Now, which showcased a much more cheerful tone, as exemplified in such songs as "Mighty Mighty Love". John Lennon was just entering this when he recorded Double Fantasy in 1980, which was expressing his hopes for the near future before he was tragically murdered only weeks after its release. 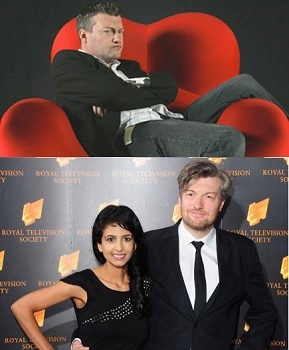 Charlie Brooker, as indicated in the page image, stopped writing "Screen Burn" around the time that he got married to Konnie Huq, realizing that it would fall into this trope on account of him no longer being countercultural and miserable, and saying the writer to take over was a better fit for it now as she was "pure hate". He carried on writing opinion pieces, but even in those he remarked in that the tone of his work got a lot lighter as his life improved and he just couldn't work up the level of hatred required any more—even realising around the time he had a kid that he had Become His Own Antithesis as being an avowed Child Hater is a constant theme of his work. On the other hand, he did announce his new fatherhood in a gushy column about how much he loved babies preceded with a paragraph explaining he was doing it entirely to make his fans angry, so he's not all nice. Richard: I asked myself "Do you see any niggers? ", and I said, "No, because there aren't any." While I'd been there, I'd never said it. I hadn't even thought it. Small time game developer Scott Cawthorn was going through some rough times: his latest game, Chipper & Sons Lumber Co., was harshly reviewed, which sent him into a depression. Furthermore, his latest crowdfunding campaign for a new game raised a grand total of zero dollars. As a result, he decided to try one last time at making a video game before quitting the industry for good. That videogame drew in millions of people, hooking them with a simple, yet effective story: a security guard at a local pizzeria, with the only companions being the killer animatronics. The fans loved it, the reviewers loved it, and Scott's game-making career rose to indie stardom. Danganronpa Another Episode: Absolute Despair Girls has an In-Universe reference to this when Super Highschool Level Writer Touko Fukawa takes a moment to wonder if her writing is going to suffer now that she's become happy through her friendship with Komaru. Her belief is that great writing comes from the depressed and the downtrodden because even when they write a happy love story (like hers) it will never be shallow, vacuous drivel, as those types of writers are still able to perfectly envision how an ideal world should look. At the end of the conversation, she determines that her natural talent will make up for it. Because Shisegato Itoi was suffering from heavy depression while developing Earthbound 64, the game was initially going to be much darker in tone. By the time the game became MOTHER 3, Itoi had mostly recovered from it, and the game's tone became suitably lighter. Following the suicide of his close friend, Spanish painter Pablo Picasso fell into a severe depression that formed the basis of his Blue Period (1901-1904). His paintings were very somber, and always made heavy use of the color blue to signify his mourning. However, in 1904, Picasso entered a romantic relationship with artist & model Fernande Olivier, leading to his Rose Period (1904-1906). With his psychological health regained, Picasso's paintings heavily featured pink tones, and many of them featured harlequins, clowns, and circus performers to show off how much better Picasso was feeling.